Can Bleez stand up to a God? This dilemma really is a right sod. Kyle thinks so too. Glomulus hasn't got a clue. And as for the rest you best ask General Zod. As for these guy on the other hand? Writer: Tony Bedad; Artist: Tyler Kirkham; and Publisher: DC Comics in April 2012. Invictus knows. Conceptually, this issue of the New Guardians, entitled 'Invictus', is like a flimflam thank you Ma'am of a read, with an origin, a dilemma, an interruption, plus a cliff-hanger that made me want to look into the future. THE ORIGIN: Many a year ago, the orange b*stard, Larfleeze, caused a whole heap of trouble for the fun loving people of Vega. He caused havoc. He slew many of Invictu's creed. He looked like a muppet. And due to all of this, he led Invictus himself to build the Orrery, house it with the surviving populace, and then hide in hibernation until he was ready to fight back. THE DILLEMA: Kyle and the gang come to the realization that they have all been played by Larfleeze, and try their best to talk Invuctus down a syllable at a time (no, not silly bull!). THE INTERUPTION: Suddenly, during this tête-à-tête, Bleez bursts onto the scene, and it starts up another battle between Invictus and the New Guardians. Not that it does them any good - the pasty faced cow. 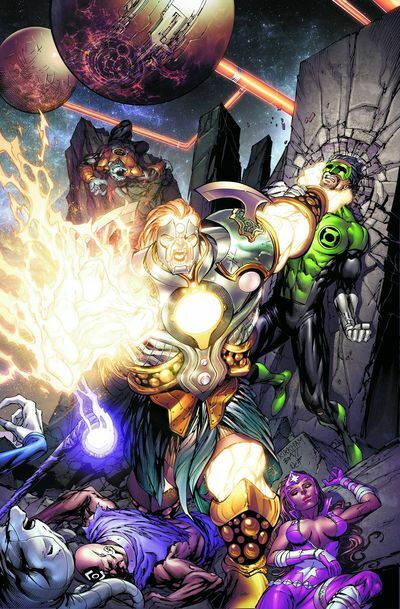 THE CLIFF-HANGER: Once the fight has subsided, and Invictus finally has the upper hand, he proposes to Kyle one simple solution - "You can all leave here alive, as long as you kill Larfleeze". I really did enjoy reading Kyle's diatribe to Invictus, especially when he said "Red Lanterns can't see past their own rage, yet Bleez came all this way to save us. Arkillo only ever saw us as potential victims, but I swear he was about to call Saint Walker his friend. By all rights, the seven of us shouldn't agree on anything. We should be at each others throats. But here we are, working together, becoming something better than what our power rings say we are". It's inspirational, huh? I can almost hear a patriotic tune as I read this in my mind. Also, it does sublimely explain what this book is all about, right? For me, personally, Kyle trying to talk Invictus down was the clincher in this comic. It was a nice change of pace to see a hero act with diplomacy instead of a fist-fight, and his points were refreshingly relatable to understand as well. The fights in this comic book never seemed to go anywhere. Heck, even when Bleez attacked, I knew nigh on straight away that this was nothing more than a break up in the discourse, and was a groan-worthy interruption at best. STORY: Invictus' back story was a nice take on an old cosmic tale. In many ways it appears' that his 'Tribe of Angels' were a precursor to the Green Lantern Corps, and it would be a nice concept to explore again in the near future in conjunction with the Guardians (the blue ones, not our multi-colored team). ART: The art by Tyler Kirkman in this tale almost had a video-game type tone to it. Honestly, I was looking for the power-meter or the score on one side of the page, as this book does have that playful and tech-slanted impression in places. Too much where the colour is concerned though. BLEEZ: So for this pale skinned cow, you need someone who has an angry goth demeanor, and looks like she could sick blood. How about Madeline Zima? She ticks off both boxes, huh? SAINT WALKER: For this very nice galactic group member, you need to have an actor who comes across as if butter would not melt in his mouth. T.R. 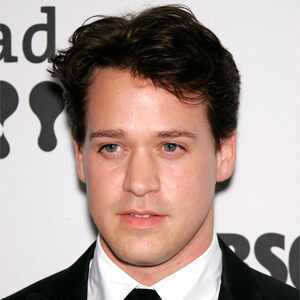 Knight from Greys Anatomy fame? Sounds like a plan. Now Please Remember That When An Angle Wants To Kill You, Be Nice. OK, so this story was like a debate, agreed? A mass debate (no innuendo implied) that had a story, some arguing, some fighting, and a final decision that was very nice to hear. One minute! Can you hear someone chant 'Jerry '? Well, it is a match of sorts! Like most of the other Green Lantern titles, this one has really started to find it's footing in the DCnU. Granted, it is not one hundred percent there yet, where creativity is concerned. Plus certain facts still need to be ironed out and clarified so we know what this team is all about. Still, it's getting there, an issue at a time.